Nine families of people killed in a pub bombing in Belfast more than 40 years ago are to take legal action against the government. 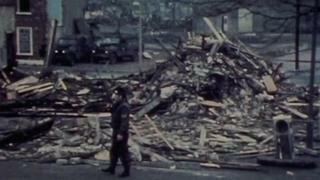 The attack at McGurk's Bar in December 1971 that killed 15 people was carried out by the Ulster Volunteer Force. Police have recently reopened the case following a critical report into the original RUC murder investigation. A solicitor for the families said they had been "treated disgracefully by the state for over 40 years". In the immediate aftermath of the attack, the IRA was blamed for placing the bomb. In February 2011, the Northern Ireland Police Ombudsman published a report claiming the original Royal Ulster Constabulary (RUC) police investigation was "biased". Following the publication, the Historical Enquiries Team, and more recently PSNI detectives in Serious Crime Branch, began a review of the case. Solicitor Kevin Winters said the families were suing the government and its agencies at the High Court over "deliberate misinformation spread by the authorities both in the immediate aftermath of the killings and for many years thereafter". "In the absence of a meaningful response from the chief constable to the ombudsman's findings and in the continued police denial that 'investigative bias' did take place, the families have been left with little choice but to proceed with this litigation," he said. A 69-year-old man arrested in connection with the attack was released unconditionally on Wednesday.